All on Four type dentures are designed to be fixed in place . As a result you don’t take your teeth out of your mouth since they are supported by dental implants. 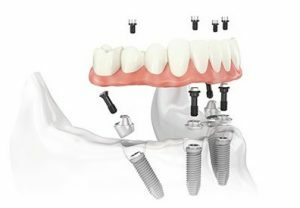 The implants have a component that is used as a bridge or connector. This component is what allows your dentist to take your teeth in and out. All on Four aka Hybrid dentures use this connector to enable the dentist to clean and repair your teeth as needed. Patients typically have four implants. Four on the upper jaw and four on the lower jaw. WHAT IS ATTACHED TO MY IMPLANTS? Several replacement options area available that differ in cost. From least to greatest is the acrylic denture, acrylic denture with titanium bar and finally a Zirconia all porcelain replacement. The procedure mimics many of the steps of a single implant placement except for the fact that many times you get to have your teeth placed the same day. WILL MY TEETH FEEL NATURAL? The fixed all on four hybrid denture will enable the patient to function with their teeth just like their old healthy natural teeth. While dentures pushing against the lips from inside the mouth can make your smile and facial appearance look unnatural, in contrast the all on four hybrid denture and implants fuse into your jawbone so they blend in with your natural teeth seamlessly. In addition the roof of the mouth also doesn’t have any material on it. This removes the gag reflex, less irritation on the gums and tissue. No altered sense of taste or reduced ability to appreciate the temperature of your food. Patients that have lost most or all of their natural teeth, have failing natural teeth from decay or gum disease or other medical conditions. In addition many patients can have existing loose or failing bridgework. Others can have full dentures or partials that are not meeting the patients functional desires. WHEN DO I GET MY TEETH? Patients can get 4 implants in the upper or lower jaw. A fixed denture hybrid will be supported by those 4 implants: (All the teeth in one jaw on 4 implants). Patients will start to enjoy the fixed (non-removable), highly aesthetic and functional hybrid denture teeth within 24 hours. This is what typically happens.